The Kronos Quartet has always been about the music of our times, but Saturday's spellbinding performance at the Edinburgh International Festival turned that on its head. As the sheer magnetic intensity of the music and its rapturous reception began to dissipate, reflection set in: what times; whose music; and how dark was that? Clearly, for a start, they draw an audience from beyond the normal horizons of concert-going typical of the EIF and 'classical' concert-going in general. Is there a general lesson to be learned in that, or is the response more a tribute to the ensemble's unique, mythical status? Remarkably, that status has been evident for so many years that one can hardly remember a time before Kronos. Dark Angels crystalizes the thought. It is the intermedia work that 'inspired' the quartet's creation, and which has touched many of the works commissioned during the course of their almost forty-year career. Before a note had been played, Crumb's influence, however indirect, was visible in the stage setting prior to the performance of Vrebalov's …hold me neighbour, in this storm… A bass drum and an ethnic fiddle stood ready; the traditional quartet was already extended. An accompanying sound projection further enriched the aural mix, with the quartet representing a European modernity against which elemental, atavistic threads of folk music and religious chant echo the rivalries that spilled into open conflict in her native Serbia during the 1990s. Strangely, though, it is the quartet writing that feels more traditional, while the soundscape, in its eclecticism, is of our time. Steve Reich's Different Trains, commissioned for the Kronos Quartet in 1988, deals similarly with dark material. For Reich, the starting point was the recollection of long rail journeys made in childhood during the early 1940s, between separated parents in New York and Los Angeles. He reflected on how different the contemporaneous rail journeys endured by European Jews must have been, and began to build the composition around sampled verbal accounts of the respective experiences. The first movement captures the exuberant, breakneck enthusiasm for technological wonder in the age of the train. There is no sentimentality about the spoken words, projected along with three pre-recorded quartets who fuse with natural sound to create the distinctive steam whistle motif that permeates the score. In the more solemnly paced second movement, the whistle has mutated to become an air-raid siren; in the reflective third, it reappears—as though subdued and chastened—after a lengthy introductory passage in which the audibility of the technological dimension has been minimized. Two small reservations about this performance: one is that the rigour enforced by synchronizing with the sound projection has the knock-on effect of minimizing the intersubjectivity between performers that brings the interpretation truly alive. The other is perhaps an explanation of the first, which is that in the scale of the Usher Hall, the balance between live and pre-recorded was drawn pretty tight. So much of their vast repertoire has been composed specifically for them, but George Crumb's Black Angels is an exception. What was it about Crumb's score that proved so profoundly inspirational? Generally, first, his music was genuinely 'modern'—recognizably avant garde, and yet not as rigorous as either (in their different ways) the European serialists or the New York minimalists. Instead, there was a gorgeous sensuality about the timbres he conjured as he explored the extended capacities of the instruments he scored for. He seemed to have found a way to create performances of immediate appeal; the question, back in the 1970s, was whether his compositions had substance—would they last? Complicating the evaluation was the company his music kept. The first recording of Black Angels, made by the New York String Quartet, was coupled with works by the little-known Canadian Charles Jones; Songs, Drones and Refrains of Death with the respected (but dull) Roger Sessions. Echoes of Time and the River was paired with a work for synthesizer and orchestra by the intermedia pioneer Merrill Ellis. It was hard to discern a pattern, and to build a sense of context. Of Black Angels, the immediate appeal was the word 'electric' in front of 'string quartet'. That, and his evident relish for things esoteric and occult, played well among a new-age, prog-rock-friendly crowd. The score, meticulously and beautifully hand-crafted, echoed the concrete poetry aesthetic of fusing the oral/aural with the visual, but Crumb went further, frequently calling—as in Black Angels—for a theatrical or even ceremonial dimension to the performance. So many of these elements have become commonplace, not least through the Kronos Quartet's advocacy, that it is hard to remember just how radical it was. At the Usher Hall, the four instruments waited suspended on 30-foot cables, spaced across the stage where each performer initially stood alone. Two gongs waited behind, while raised in the background were three pulpit-like structures, shrouded in black. Naturally there is a lot of movement around the stage as the work progresses; it was interesting to experience a sense of poignancy, or of being 'touched', when two or three of the musicians came together, against that general background of separateness and alienation. Interesting too to be reminded of another sharp difference between Crumb and the European avant-garde in terms of their respective relationships with musical history. Another of Crumb's art-like practices is collage, and in the section titled 'Sarabanda de la Muerte Oscura', he sets out with a haunting parody of a 17th century viol consort, which mutates into a reminiscence of Schubert's 'Death and the Maiden' theme. In 'God-music', the allusion seems to be to Messiaen's Quartet for the end of time. At this point, though, an undertow of humour emerges. The black shrouds over the pulpits are drawn to reveal three sets of tuned wine-glasses. Played with bows, the sound they make is sickly-sweet enough to hint that the cello solo is being sent up, while at the same time the chords are so immaculately judged that it is just as easy to hear them 'straight'. So is this music of substance? Yes, absolutely. Besides the astonishingly beautiful sound Crumb creates, via the superb, committed playing of the quartet, there is formal discipline and considerable density of allusion. Unlike, dare I say, the encore—Clint Mansell's Death is The Road to Awe. Interesting it is not; existentially satisfying in the moment, though, it is, as the thunderously cinematic sound projection, replete with massive taiko drum sounds, barges to its climax. 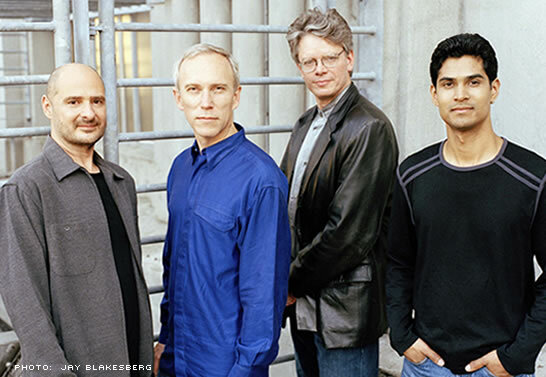 Still, Mansell's score and the Kronos Quartet's performance won a Golden Globe nomination for its movie, The Fountain, which serves as a reminder of just how broad the quartet's influence has become.